'Mother 3' (マザースリー Mazā Surī) is a role-playing video game for the Game Boy Advance handheld game console, developed by HAL Laboratory and Brownie Brown and published by Nintendo. It is the third and final video game in the Mother series, known as EarthBound outside Japan. Originally developed as a sequel to EarthBound on the Nintendo 64, Mother 3 was initially canceled; however, in June 2003 during a Mother 1+2 television commercial, the game was announced to be in development for the Game Boy Advance. Up until its release, the game remained near the top of Famitsu's most wanted games list, only once falling below number 10. Immediately before its release, Mother 3 was the most wanted game in Japan according to Weekly Famitsu. 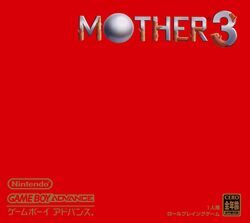 Mother 3 has not been released outside of Japan, possibly due to its darker and more mature themes. Fans outside of Japan have enjoyed the game through an unofficial fan translation by Starmen.net regular Tomato.